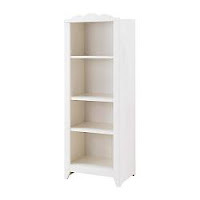 The 1st piece furniture we bought for our new baby is a 4 Tiers rack in white from IKEA. It recalled me to a funny story. I told my hubby that I need a space to put the baby/parenting's magazines and books (which increase monthly) in our bedroom. He didn't allow it at first as there's a "pantang larang" rule of not moving furniture and hammering things in the house during pregnancy. Finally my hubby gave in and let me buy it. One night we brought this rack home and he assembled it then moved it to our bedroom. What happened next? Our courteous neighbour gave him a lesson about the "pantang larang" once she saw him watering in the garden next day. She overheard the noisy hammering sound last night.Oh no, it's indeed my fault. Sorry hubby. Nevertheless, I'm glad that we have bought this rack. Other than restaurants, I think the next frequently visited place is book stores. Buying book is like a therapy to ease my tension and fear during the whole 9 months. It's so nice to look and read the parenting books as well as the children books. 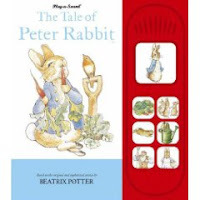 The 2nd book I purchased and read for my new baby is "The Tale of Peter Rabbit" by Beatrix Potter but I selected the sound book version. Since then, I would buy any bunny-related books and even a flush bunny from IKEA. Don't you think the design of this rack look quite old English? Ya, partly I was inspired by Beatrix Potter's collections. Now, this rack is nearly full in capacity (80% books and magazines) and I'm thinking how to convince my hubby to buy a small book rack for my boy's playroom. 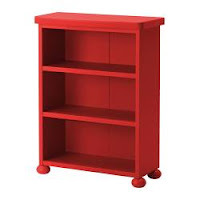 My current choice is IKEA's "MAMMUT" red shelf. For Sale: Why Not A Glass Bottle?